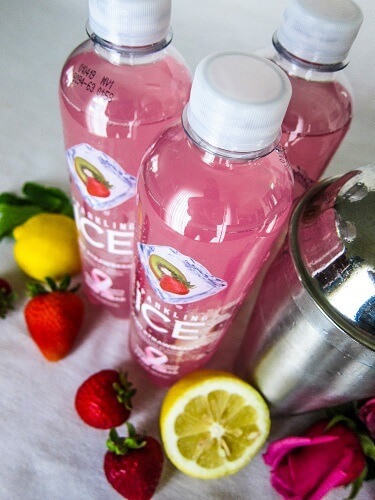 Lets get Fizzy with Sparkling ICE and my Strawberry Kiwi Sparkling Tonic! I love sparkly things, especially in cocktails! And I have been making quite a few lately! It has been really steamy here in Minnesota this week! We had a heat index of about 108F degrees a few days back, and it created some monster thunderstorms, but they didn't do much to cool it off outside. I pretty much expect that July will be hot as it is the peak of Summer. But you know what makes it better? Those cocktails I mentioned earlier. I don't mind the 90F degree heat so much when I am sitting on the patio sipping something cool. I love my Summer drinks, but what I don't love is added sugar in them. A lot of drink mixes come with loads of sugar so I avoid that stuff. But you know what I just discovered that is perfect for using in cocktails? 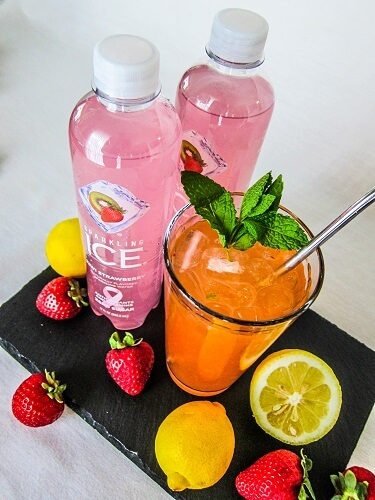 Sparkling ICE ! It is a fruity sparkling water with zero sugar, zero calories, vitamins, antioxidants and loads of natural fruit flavor. When I was younger I pretty much lived on sparkling water. I have never been one to drink pop, but I love the fizz of sparkling water, and the Sparkling ICE is some of the most delicious I have tasted! My boyfriend Eric has been drinking it for a while, because he decided that he wanted to drink less sugary soda, and he buys this instead. He was the one who first got me to try it, and it is super refreshing and delicious! The Kiwi Strawberry and Lemon Lime flavors are my favorite. The Lemon Lime is good for when you want a citrus twist in your cocktail, and even just adding a shot of vodka or tequila to it is a simple cocktail that anyone can make! But I made something a little more fancy yesterday, a Strawberry Kiwi Sparkling Tonic! I have been craving a gin drink since I saw one in a restaurant on a cocktail menu, but I had decided not to order it because it had honey in it (which isn't vegan), plus it had another sugary syrup too which was too much sugar, and I told myself, I should make one at home because I knew I could make one that was just as good. So I bought myself a bottle of gin, and some Kiwi Strawberry Sparkling ICE as well as some fresh berries and lemons and I had the makings for a delicious cocktail! I muddled mint and strawberries in a shaker, then added the lemon juice, gin and Kiwi Strawberry Sparkling ICE and voila! A delicious refreshing drink. It only took me a couple of minutes to make, and it was as good as something I would have ordered in a restaurant. If you want to impress your friends at your next gathering make them one of these cocktails, recipe is at the bottom of the post. 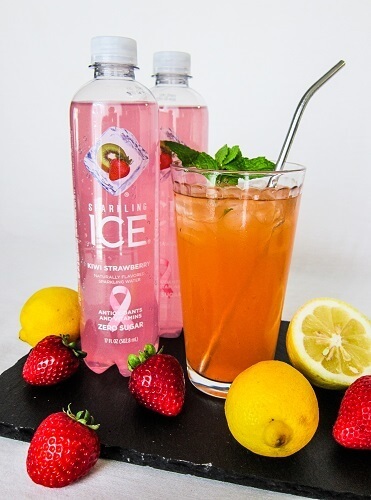 Drinks with no added sugar and only natural ingredients are important to me, which is why I often choose Sparkling ICE as my mixer! Most of us are wanting to look good in our Summer clothes and be confident, and making drinks that are low in calories, and don't make us feel yucky or give us a sugar buzz is a good way to keep us feeling that way! 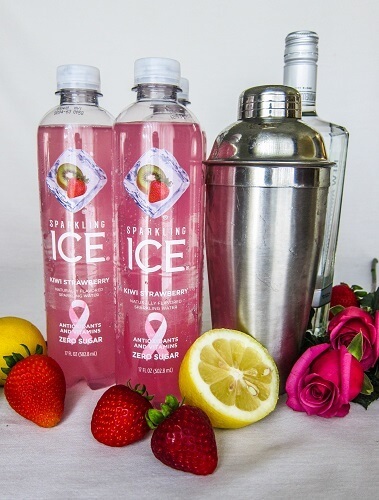 You can find all 16 flavors of Sparkling ICE on Amazon HERE! In a cocktail shaker, combine the ice, strawberries, mint leaves, and muddle (smash) it all together with a muddler, or the end of a wooden spoon if you do not have one. Add the lemon juice, put the top of the shaker on, and shake it briefly, then pour in the Sparkling ICE and stir it a few times to blend. 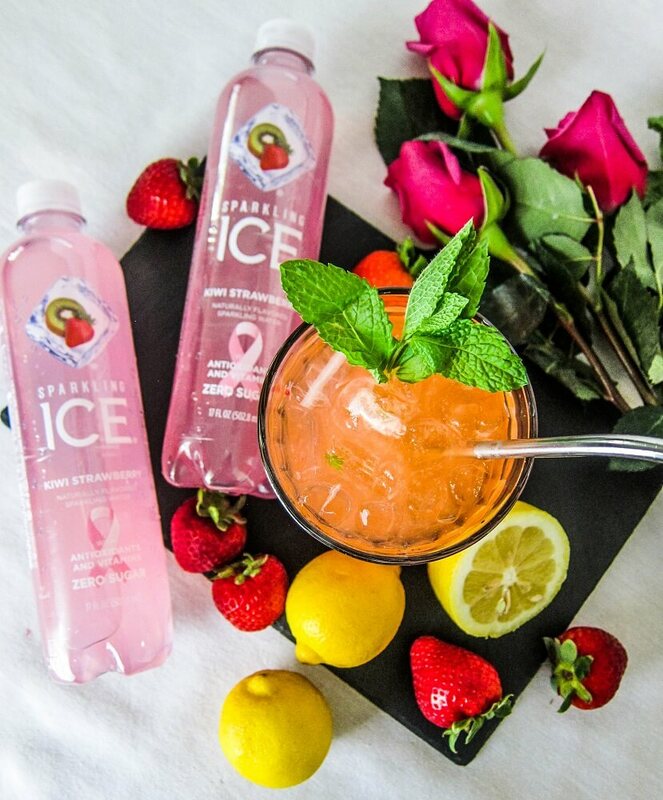 Pour into a tall serving glass over ice, and enjoy!